Yesterday I received a message inquiring about applying to graduate school and how they should begin preparing for the application process. I thought this was a great question and that I should share my response with a wider audience. Of course, I can only speak with any real authority on applying for a history masters and/or PhD program but, for the most part, much of this applies to all graduate programs. First, it is never a good idea to apply for a graduate program at the last minute! If you are thinking about applying at the end of 2014 or beginning of 2015, now is the time to start planning. I think the biggest mistake applicants make is blanket-applying to a large number of programs without researching what topics or areas of study that program offers or specializes in. For example, many schools specialize in certain areas of history, like European, American, Latin American, or Ancient history. If you want to study Chinese history, you shouldn't apply to a program that doesn't offer courses on that topic or specialize in that field. It doesn't matter how good your grades are, you won't get in! Once you have selected a program with topics of study you are interested in, you need to reach out to the faculty member (or members) you would like to work with. Yes, emailing a stranger can be uncomfortable, but connecting with faculty and letting them know you are applying to the program and are interested in working with them is crucial. They will be inundated with applicants and this will help you standout from the crowd. Don't feel awkward, scholars love having motivated students who want to work with them! Almost every program will ask for some form of personal statement. These are difficult to write so start early! They need to be thoughtful and specific. You want to highlight why you want to study history (or another subject) and why you will succeed in their program. You want to be clear about what you want to study, but not so specific that they think you aren't willing to learn new things and grow. So for example, you might say I want to study the American Revolution, instead of saying I want to understand what made General George Washington great. You should also name drop in your personal statement. If there is a faculty member you would like to work with, mention them by name. You want to tailor your personal statement to each university you are applying to. If you would like to read my personal statement as an example, just Email Me! Some programs will also ask for a writing sample. I can not stress enough that this needs to be well-written and error free. The good thing about graduate programs is no one cares how "well-rounded" you are. They are looking for specific skills and areas of competency. So if you are applying for a humanities program, odds are no one will be overly critical of your less than stellar math grades. That being said, your overall GPA should be good. If it isn't you need to explain why in your personal statement. Being honest makes you a more viable candidate. You will also probably be required to submit test scores--either the GRE, LSTAT, GMAT, etc. More and more schools are placing less emphasis on these scores, but they are still important. You need to meet the minimum requirements to get your foot in the door. 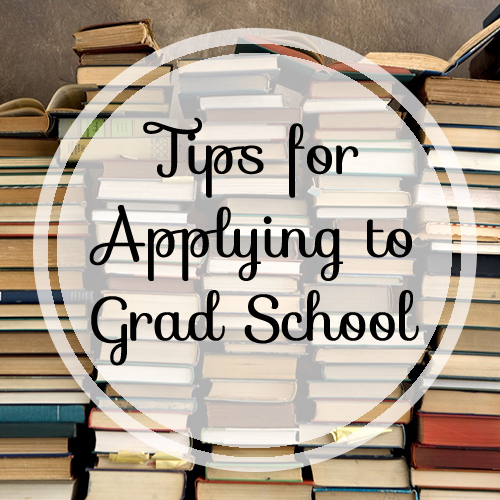 Unfortunately, everyone applying to grad school will have a good GPA and test scores, so you really need to study and do the best you can on these exams. Fortunately, you can take them multiple times, but be warned they are pricey. I recommend studying for 2-3 months and then taking the exam for the first time. But make sure you have 6-8 weeks before your application is due, just incase you bomb your first attempt and need to re-take. These are so important! You need to carefully select who you ask for letters of recommendation--another reason why starting early helps. Ask professors from your undergrad who you have worked closely with. Asking professors who don't remember you or don't really know you will yield horrible rec letters. They will be generic and unenthusiastic, and this is an immediate red flag for admission committees. So, if you haven't connected with any of your undergrad professors, now is the time to get started! Establish relationships with them by working on a special project or paper. That way they will have something meaningful to write on your behalf. Do not ask family, friends, or employers. Graduate programs care mostly about your academic performance. Don't wait until the last minute to ask for a letter of recommendation from a professor. And when you do ask, help them out by providing a cheat sheet of yourself. Include your grades, GPA, research projects, awards you have won, etc. This will help them craft a really specific letter that highlights all of your talents and achievements. I am sure there are things I am missing, but these are the most important parts of the application process. If you have any specific questions about applying or about history programs in general, please don't hesitate to Email Me! Like I said before, scholars love to hear from promising students and love (I mean love) to mentor (it makes us feel important lol).